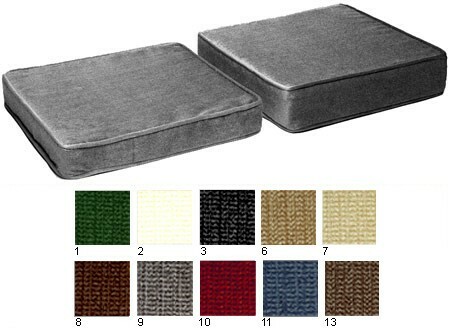 Half Size Booster Cushion is rated 4.17 out of 5 based on 30 ratings. The perfect way to solve position problems for young children. Similar in style to our Box Cushion, our half-size booster cushion (14" x 15")* is filled with high-density foam to lift your child comfortably to the keyboard. Booster cushions do have four ties to attach to the bench and are available in 13 colors and two thicknesses - 2" ($65) and 3" ($77). **Please Note - If you do choose the 3" thickness, you MUST have 7" clearance between the top of your bench and the underside of your piano so your child's legs will fit.